The Lemoyne Star quilt block is one of the traditional quilt blocks used in star patterns. This class uses a large focus print to make one large star. Need a little help with your quilting project or just want to sew in the delightful company of others. Come sew in "Your Sewing Room Away From Home". Join this two-day machine embroidery retreat with Claudia Dinnell. Celebrate the first Christmas with Mary, Joseph, and the Christ child in a lowly stable in Bethlehem. Shepherds, wisemen, and glorious angels on high marvel at the signs and sight of His birth. Welcome to Kimberbell Club! Are you new to embroidery and want to learn fun techniques? Our monthly Kimberbell Club is the perfect place for you. Each month you will complete a different embroidery or in-the-hoop project. Kimberbell designs are clever, whimsical and a fun way to learn different embroidery techniques. Come join us in the store! Class and pattern free with purchase of fabric from us. On February 16th come to an information only class and learn about two upcoming Smith Street BOM's. These are both machine embroidery projects that may be made in multiple sizes. Nancy Cheadle will be leading the the Flower Dance quilt. Dawna Harrison will be leading Merry & Bright. Join us for an exciting year of quilt projects. January 06 is start of 2019 Quilt Finishing Club Classroom is open for sewing for students prior to lecture and until 4:30. Lecture: 1 pm. 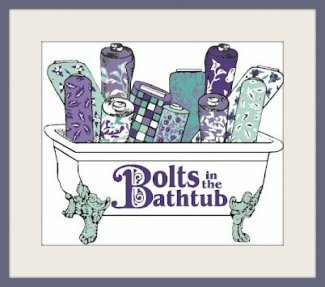 WELCOME to the new Bolts in the Bathtub website. See what's happening at a glance using the calendar and look for classes to your liking in the upcoming days and weeks. Find out about upcoming events and classes, special announcements and special hints and tips. If you are a friend from far or near, we welcome you to the new online shopping feature. You've always been able to call and get a project shipped to you, now wander the aisles on your computer. Our staff is ready to help you with your shopping list for your latest project or upcoming class - fabrics, notions, threads. We pride ourselves in having a wide range of the best supplies available for your projects. If you're looking for that new sewing machine you can't go wrong with - made to create!! We love to see you and what you are sewing. Bring in your projects and share them with us! The store is filled with inspiration and creativity. Come and visit!